5 Phrases Sociopaths and Narcissists Use To Undermine Your Confidence. 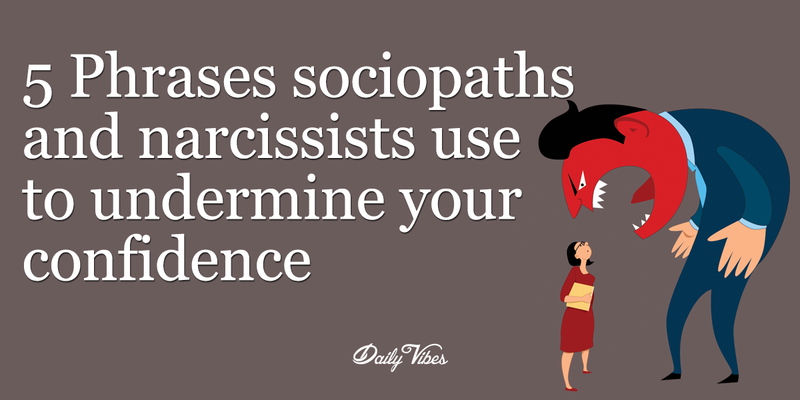 Have you ever wondered if someone you know is a narcissist or sociopath? How do you tell the difference? First let me say that all sociopaths are narcissists, but not all narcissists are sociopaths. Confused? Let me try to explain. While there are definite similarities between the two personality types, the motives behind what they do and say are different. The sociopath wants to control every facet of your life, while the narcissist wants you to devote all of your time and attention to them. However, both personality types will say similar things to get you where they want you. Below are 5 sentences that both narcissists and sociopaths use that make you feel like you’re crazy. They will tell you that they hate drama, but you’ll soon learn that there’s more drama surrounding them than anyone you’ve ever known. Any time you mention your concerns or frustration, they’ll declare their hatred of drama and make you feel bad for reacting to their horrible behavior. They make you feel like you’re the drama queen or king. Then, they throw you into that same “crazy pile,” making you feel insecure and diminishing your self-worth. While bringing you down, they show justification for their toxic behaviors. After once showering you with 24/7 praise and flattery, they’ll ignore you for days on end and wait for you to react. When you finally do, they’ll accuse you of being sensitive or needy. They’ll insult, belittle, and criticize you (sometimes in a teasing/joking way), pushing your boundaries until you finally speak up. Then they use your reactions to make you seem crazy. Within weeks, they can turn an easy-going person into a hot mess of insecurities and self-doubt. We all misunderstand what people say from time to time. But the narcissist and sociopath will intentionally say things they know will set you off. Then when you react, they’ll turn it around on you and blame you for misunderstanding. Oftentimes, they’ll even deny that they ever said it. This is called gaslighting—blatantly doing or saying something, and then blaming you for misinterpreting it (or denying that it even took place). The fact is, you understood what they said perfectly fine. They’re just trying to make you doubt your sanity. This is the hoped-for result that all sociopaths and narcissists want. They use manipulating phrases and actions to make you feel like you can’t survive without them. But, they don’t do this because they want a healthy relationship with you. What they want is control over you, and they control you by making you feel like you’re crazy. Don’t let them get away with it. You can and will survive without them.